In general, the storage area network (SAN) applications on Fibre Channel (FC) switches periodically probes the host FC host bus adapter (HBA) ports for diagnostic data. In large data centers, the collected diagnostic data helps SAN support teams for monitoring and troubleshooting the FC HBAs. Read Diagnostic Parameters (RDP) is a FC Extended Link Service (ELS) introduced with the FC-LS-3(T11) specification. The RDP ELS (command code:0x18) provides a mechanism to collect the information that can be used for the diagnosis of link or port related errors, or degraded conditions associated with the designated FC port. 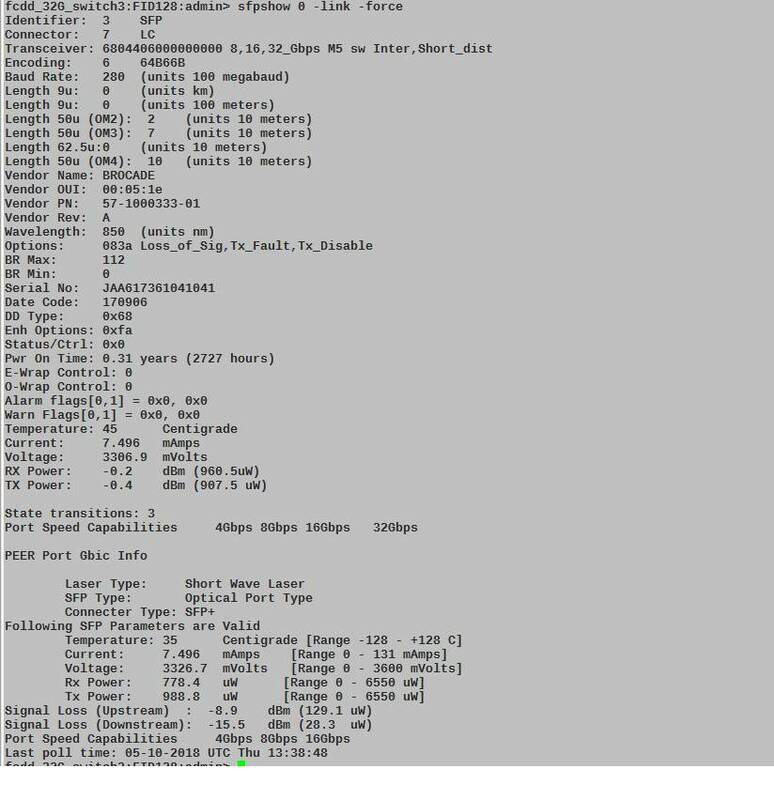 Some of the information includes port speed, link error status, port name, and Small Form-Factor Pluggable (SFP) information (such as temperature, voltage, and so on). This data is useful in predictive analysis to identify the faulty HBAs quickly. The RDP supported FC switches transmits the RDP ELS request payload to the host HBA port and the host HBA port responds to the same request, as shown in Figure 1. Starting from AIX 7.2 TL02 SP00, AIX 7.1 TL05 SP00, AIX 6.1 TL09 SP10 and VIOS 2.2.6.0 releases, with 16 Gb 2-port FC and 10 Gb FCoE adapters with Feature code: EN0A, EN0B, EN0H, EN0J, EN0K, EN0L, EN0M and EN0N. With 16 Gb 4-port and 32 Gb 2-port FC adapters with Feature code: EN1A, EN1B, EN1C and EN1D, starting from AIX 7.2 TL02 SP02, AIX 7.1 TL05 SP02, AIX 6.1 TL09 SP11, and VIOS 2.2.6.20 releases (this is the minimum AIX level required for these adapters). Port Names descriptor for the Fx_Port or Nx_Port for which diagnostic parameters are being provided ) Refer to the section 4.3.48 of FC-LS-3 (REV 3.10) specification (see resources on the right) for more details on RDP request payload and response descriptors formats. The following sections explain RDP ELS related commands on Brocade and Cisco FC switches. 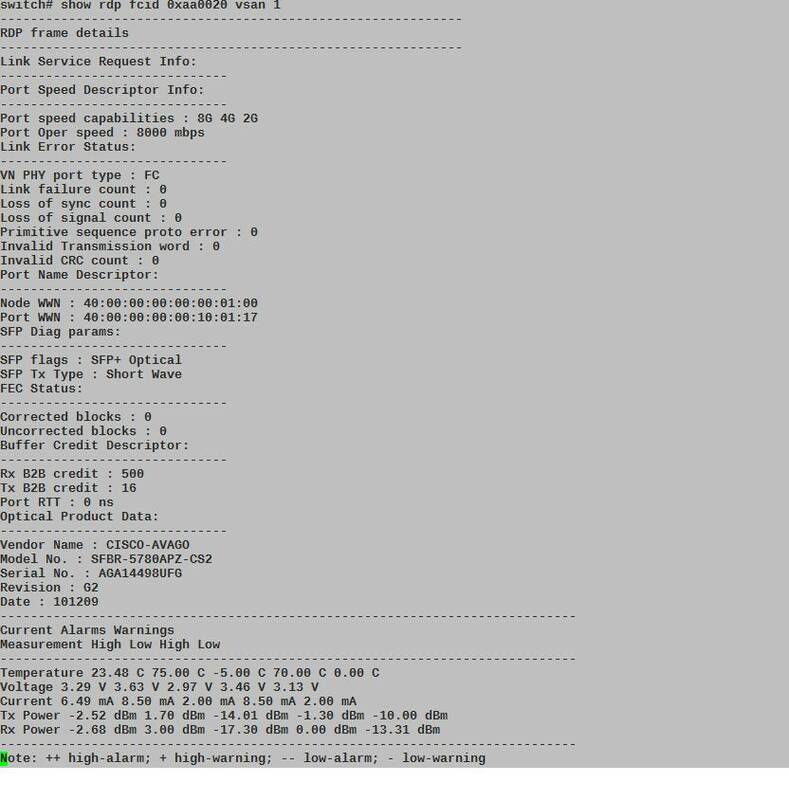 The Brocade FC switches with RDP ELS supported fabric OS level sends an RDP ELS request to the connected host FC ports periodically. The value for the RDP polling cycle can be tuned from 1 hour to 24 hours. The RDP polling cycle value to ‘0’ stops sending RDP ELS requests to host HBA ports. Figure 2 shows the current RDP polling cycle value. Figure 3 explains how to modify the RDP ELS interval to 2 hours. The Brocade Fabric OS CLI commands, sfpshow and portshow shown in Figure 4 and Figure 5 sends an RDP ELS request to collect diagnostics information of the host HBA port. In these examples, the host FC HBA port is connected to port number: 0 on the FC switch. On RDP capable Cisco switches, the show rdp command sends an RDP ELS request to collect diagnostics information of the host HBA port. Figure 6 shows the collection of such data for the host port with the N_Port ID: 0xaa0020.